! This is NOT a method of direct communication with WEST MILFORD FLORIST for purposes of ordering or rectifying problems. I’ve been getting flowers here for a few years and West Milford always does a fantastic job. The handwritten notes on the flowers are a beautiful touch and my wife is always thrilled with the arrangement. I’ll be back! Beautiful bouquet, delivered to my work at the perfect time, and the flowers lasted beautifully. Beautiful arrangement for my mom . Thank you so much for showing her how much I love her thru the flowers . Plus you adjusted the delivery to accommodate her going out the day . Quality flowers, beautifully arranged as always. 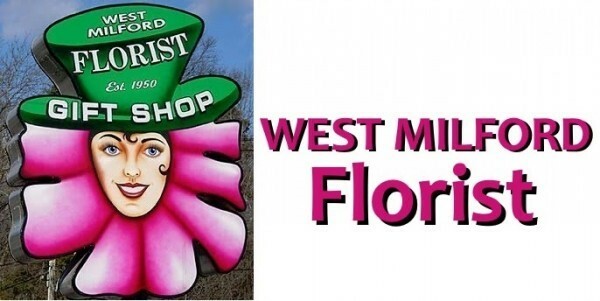 Thank you West Milford Florist for years of dependable floral service and a huge selection of gorgeous gifts and decorative items for my home. Awesome flower arrangement. Always a pleasure working with them. Never disappointed. Flowers were beautiful and last a long time. Arrangement was nice and delivered on time and friendly driver. The bouquet sent was absolutely beautiful! Delivered with a smile and put a smile on my face as well. Thank you! Nice arrangement delivered promptly on relatively short notice! The flowers I sent to my mom arrived within an hour of ordering them! They are beautiful and perfect. Thank you! Always exceptional service and amazing floral arrangements! They delivered a beautiful arrangement on time. I loved the online ordering, the flowers were delivered promptly, and they were gorgeous!!! I will use this service again! Lady called immediately after placing online order and offered another arrangement (which I am sure was just as beautiful). That is the beauty of a small business-excellent service for customers. I will shop here again. Thank you. The flowers were beautiful and delivered very quickly. very nice but not quite what I expected. I know the flowers were at the service and I know they were "nice". It would've been great if the florist could've snapped a picture or 2 and emailed it so I could've seen how nice. Beautiful arrangement at a reasonable price! My Admin. Assistant loved them! THANK YOU! My flowers were delivered on time and they were very fresh and beautiful. I'm satisfied all around, timely delivery and lovely arrangement. We ordered a Thanksgiving centerpiece from you for our son's in laws in Ringwood, having chosen it from your website. Had my son send a photo and I was very pleased to note that it was nearly an exact copy. You did great... BRAVO! Beautiful & unique floral arrangement! Not the typical flowers you'd expect. Lovely presentation on my Thanksgiving table! My friend was delighted by the flowers she received. The service was excellent! Delivery was received when expected and the floral arrangement was gorgeous! The flowers lasted for nearly 2 weeks. Thanks so much. The arrangement that was delivered was so gorgeous! The quality of the flowers was impressive, and surpassed expectations! Thank you! The recipient loved the flowers!! Excellent and professional service. Personalized ideas and love expressed in understanding my desires. Prompt and friendlly attendant. The arrangement is absolutely stunning - love the colors and variety of flowers. I would only suggest that instructions for care could be included with the gift card. Thank you for your service! A very special "Thank You to Jill" for a beautiful, outstanding bouquet for Diana and Randy. It showed the beautiful colors of fall with delicate and varied flowers. Loved it! My arrangements is filled with such a beautiful variety of flowers. Spectacular. Thank you. Excellent arrangement, excellent service as always. The bouquet was perfect! My mom truly loved it~! My only suggestion is free delivery within West Milfrod. While I know it's a big town, I think it's a courtesy (and savings) most would appreciate. Thanks, again! It was a great service, I love my flowers. I was very pleased with the prompt processing of my order and the beauty of the bouquet. This was for my Mother's birthday and she really appreciated receiving the flowers. My brother sent me a picture and they were gorgeous! I will definitely use your business again! Did a wonderful job with the arrangement, the flowers were beautiful! I loved the flower arrangement. It was the perfect centerpiece for our Easter table. My daughter, Megan McNiff, sent it and she was so proud of her gift when she arrived for dinner. Thank you. I ordered a birthday basket for same day delivery...I promptly received a direct call to discuss the flowers as those on the photo were not available. A lovely basket was received by Auntie who said they were the most beautiful flowers she's ever received! Thanks West Milford Florist! Beautiful arrangement, fresh and festive. Thank you! I have ordered many custom items from West Milford Florist and they all have been absolutely beautiful! Flowers were beautiful and top quality, arrangement was delivered exactly when I requested. Very happy with the quality of both the service and product. Flowers were on time and beautiful. Meant a lot to our family members. Arrangement was very nice and even bigger than we expected. Thank you for quality service and convenience. You do the most beautiful work . I moved away from West Milford just short of a year but my parents still live there . I love that I can order flowers for my mom and know that they will be perfect and make a difference in her day . Always pleased with arrangements and the service. West Milford Florist is the best. My mother won't go to any other florist so when the flowers were for her, I had to order from them. Thanks for a beautiful arrangement!